2 changes to the Nautilus Provincial Marathon & Half Marathon this year ... a new name, and the addition of a 4-person Marathon Team Relay. 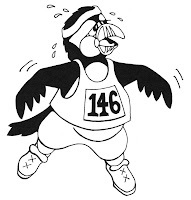 The 2010 Huffin' Puffin Marathon will take place on Sunday September 26 and will feature the traditional Marathon, the very popular Half-Marathon, and the brand spanking new 4-person Marathon Team Relay. Details and registration available at huffinpuffinmarathon.com.